It’s Part 3 of Natural Beauty Week, I hope you lovely lot have already read my previous posts about Green People and Balance Me. 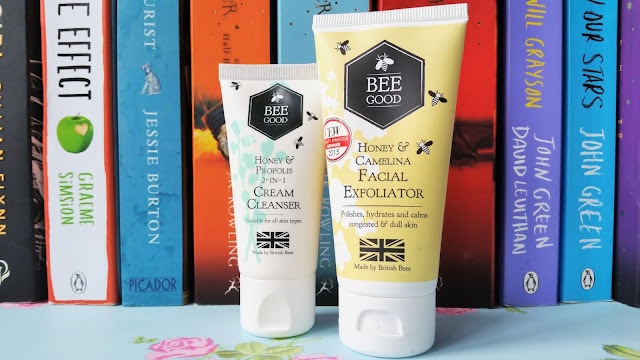 Today we’re looking at Bee Good, an award-winning company that are proud to be the only British premium skincare brand to exclusively harness the natural healing powers of British beeswax, honey and propolis. Bee Good’s innovative products contain ethically sourced bee-ingredients, meaning that their bees are never harmed. They are very passionate when it comes to supporting British bees, not only do they give a percentage of their proceeds back to beekeeping causes and the apprenticeship and education of young bee farmers in the UK, with every order placed on their website, they also include a little pack of Seed Balls, each containing around 100 seeds of various bee-friendly plants. Bee Good take natural beauty to a whole other level! 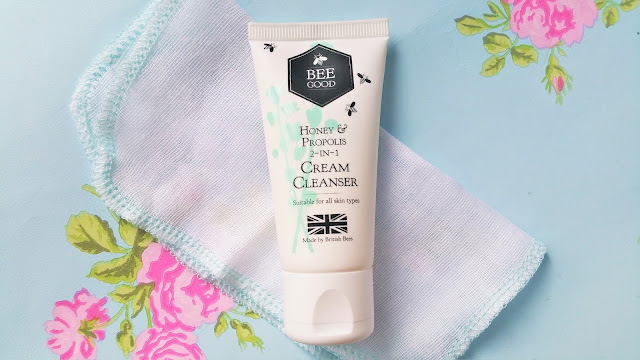 I was kindly sent two products from Bee Good to review for Natural Beauty Week: the Honey & Camelina Facial Exfoliator* and Honey & Propolis 2 in 1 Cream Cleanser* along with an adorably tiny muslin cloth. The 2 in 1 Cream Cleanser (£11.50/100ml) is also available in a dinky travel sized version, perfect if you’re going on your holidays or if you’d like to try the cleanser before investing in a full sized tube. Once you’ve tried the travel sized version and fallen in love with it (which you will) their full sized version is available in a money-saving duo pack, plus you can purchase additional muslin cloths on their website too, they really have thought of everything, haven’t they? So, only a little of the thick creamy formula is needed, but I have to admit I couldn’t resist generously slathering this on. The cleanser removes all the built-up grime in just a few gentle swipes, gently exfoliating the skin to ensure a thorough clean whilst lifting all traces of makeup. Every time I use it I can’t help but compare it to the iconic Liz Earle Hot Cloth Cleanser. The jury is still out on which I prefer, the similarities really are astounding, but I do know I love how this makes my skin feel; nourished, soft, smooth and very, very, clean. The Honey & Camelina Facial Exfoliator (£10.50/50ml) is also a welcome addition to my skincare routine. 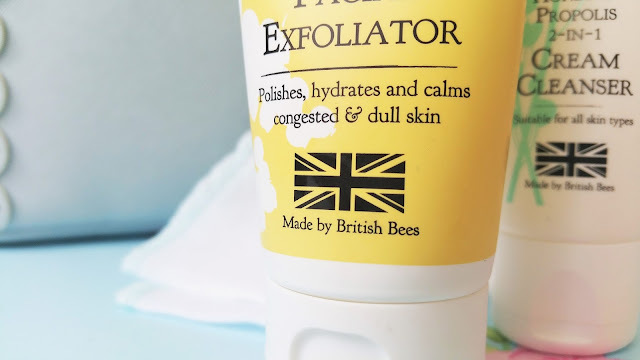 It contains all kinds of wholesome ingredients such as British wildflower honey, beeswax, wheatgerm oil and Camelina seed oil. The creamy formula is packed full of milled lavender flowers that buff the skin gently but effectively. The treatment is simple but incredibly nourishing and hydrating. This exfoliator proves that chemicals and overly abrasive granules aren’t needed to achieve a deep clean and baby soft skin. The treatment is suitable for all skin types, as the wheatgerm oil helps to restore moisture to thirsty patches, the antibacterial properties of the propolis help tackle blemishes and the lavender calms and restores balance to irritated skin. Even though the cleanser and muslin cloth combination work as an effective exfoliator, I’ve been using this treatment twice a week to give my oily skin a deep clean and my complexion a boost in the radiance department. Bee Good really embodies what a natural beauty brand should be. It’s holistic and sustainable approach to the well being of it’s customer and buzzing little workmen is refreshing and inspiring. With the launch of their new Youth Enhancing collection Bee Good is going from strength to strength. It’s exactly the kind of company I wanted to discover when I started this journey into natural beauty and I can’t wait to see what they come up with next. "Natural Beauty Week | ModelCo. Luxury Facial Oils"
"Natural Beauty Week | Balance Me"